After a long break, I'm going to try to catch up on the blog a bit, but in the meantime I'll put up a few very recent walks. 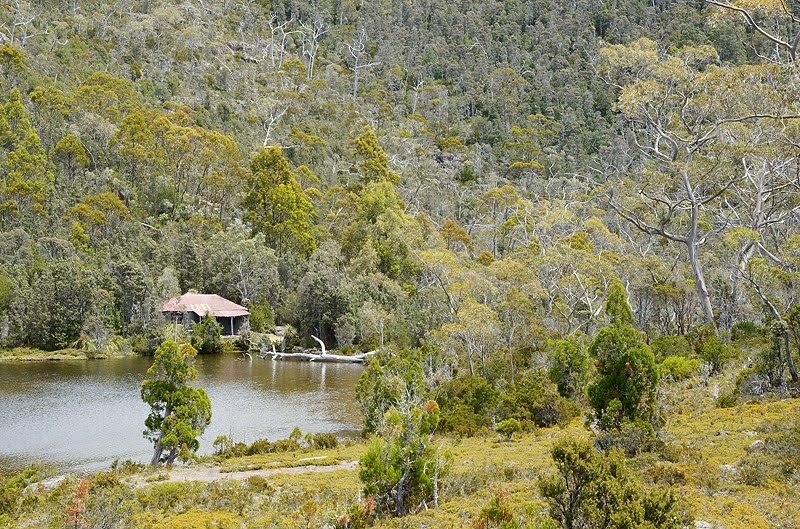 This circuit from Lake Dobson in the Mount Field National Park is a good solid walk with some great scenery. Starting from the carpark, head up the road towards the ski fields. After around 900m a signposted track heads downhill to the right, leading to Platypus Tarn, Lake Seal, Lake Webster and Twilight Tarn. It is around 3.5 km along here to Lake Webster. Turnoffs to Platypus Tarn and Lake Seal will be passed. Each makes a picturesque side trip, Lake Seal probably more so. 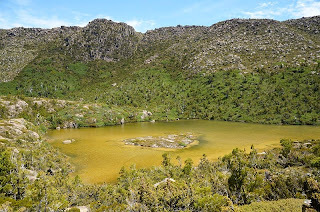 The Platypus Tarn track requires a solid re-ascent. Snakes may be encountered along the way in warm weather. The Broad River is crossed where it commences at Lake Webster, and the track then rises steadily to Twilight Tarn. Here is the old hut (day and emergency use only), which has some decaying artifacts inside, including a logbook reference to the visit of Sherpa Tenzing Norgay in 1963 (see next blog entry). In earlier days this hut and tarn hosted parties and ice skating. The track continues up the hill, passing the Twisted Tarns before arriving at Lake Newdegate. This lake lies at the northern end of Tarn Shelf. This is a quite spectacular rock shelf part way down the steep side of the Rodway Range, with many large and small tarns scattered along its length. It is well worth a visit. It is especially impressive around April when the fagus is out, but is enjoyable at any time. The track rises to the Rodway Hut over undulating terrain past numerous tarns, with spectacular views both up the hill to the Rodway Range and downhill to Lakes Webster and Seal. There are also views across the deep valley to Mount Field East. 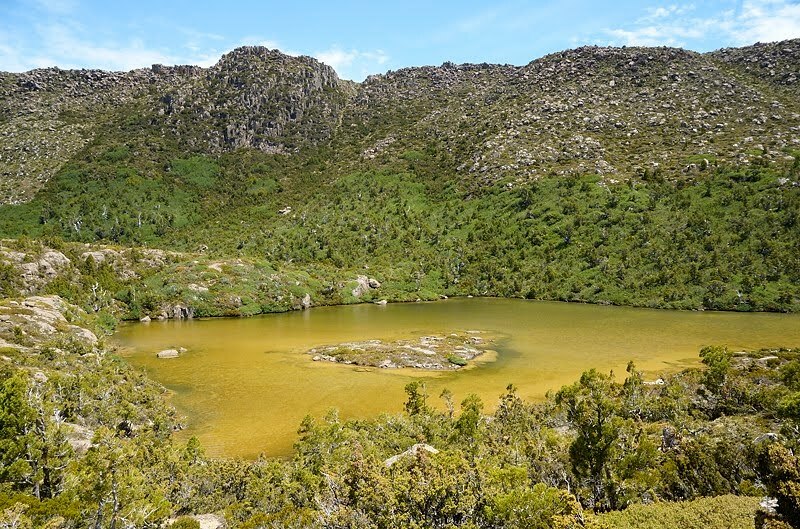 The tarns can be good for a swim on a warm day, but beware, Tasmanian tarns can be very cold even when the weather is warm. The Rodway Hut sits at the bottom of the Rodway ski tow. Beyond the hut, the track rises then heads east on quite level ground, mainly duckboarded. 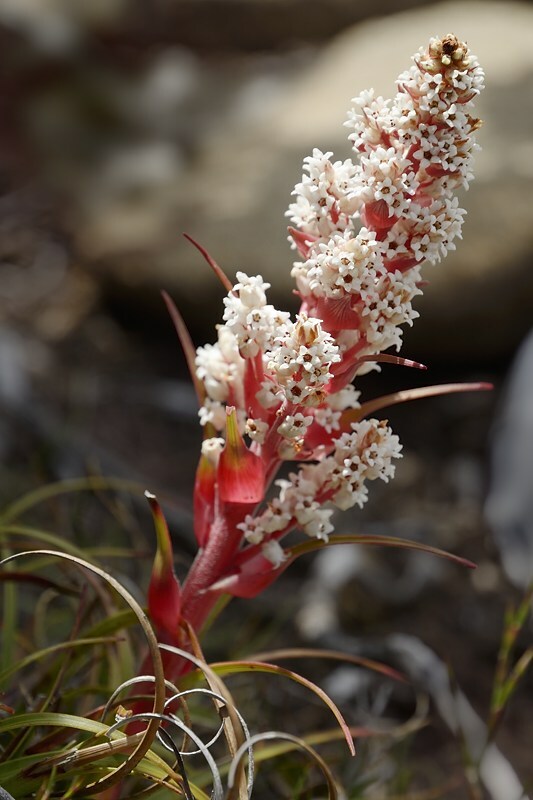 At a track intersection, the left fork (not the left turn to the lookout) is probably the more picturesque, but takes a little longer as it winds amongst the boulders and snowgums to arrive at the lower ski lodges and the ski access road. (Taking the right fork will bring you to the closed Sitzmark ski lodge, which can also be worth a look. This track is a little easier.) The way then descends the steep zig-zagging ski field access road, before heading off to the right along a pleasant track which descends to the shores of Lake Dobson and returning to the carpark. This was a good walk the other day - it was quite warm, and I was pleased to be able to get water regularly. One Tiger Snake was encountered a little below Twilight Tarn, but he was more alert than me and was leaving the track by the time I saw him. The track was quite dry, although I think at times the section in the valley can be a little wet under foot. It is about a four hour walk, although with stops and sightseeing it could take longer, and is about 13.5km.